EUR/USD sank to its lowest levels since July 2017 in early trading on Friday, breaking out of a period of consolidation that began in May. The Turkish Lira has fallen 30% since the beginning of the year and 10% since the beginning of August as fears mount over the health of the Turkish economy. The Turkish Lira’s slide could harm European banks that have invested in Turkey. Reports that the ECB officials are concerned about European banks’ exposure to Turkey triggered selling in the Euro, with EUR/USD breaking below major support of the 2018 low of 1.1507. A Financial Times report indicated that that Spain’s BBVA, Italy’s UniCredit, and France’s BNP Paribas could be affected by the weakening Turkish Lira. Data from the Bank for International Settlements (BIS) showed that Spanish banks are owed $83.3 billion by Turkish borrowers while French lenders are owed $38.4 billion and Italian banks are owed $17 billion. 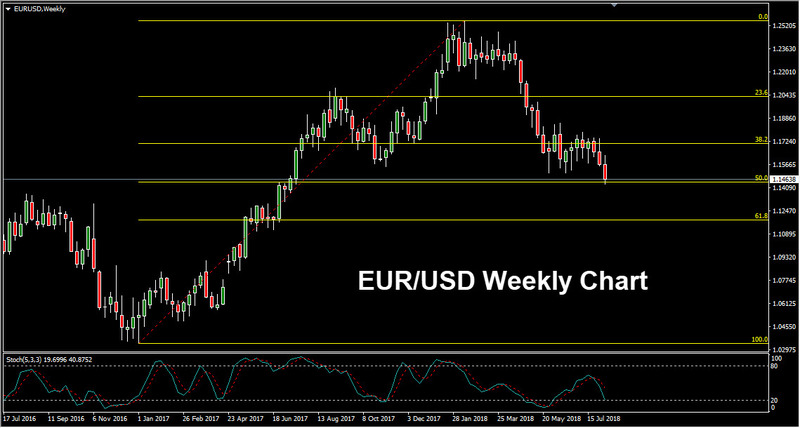 Zooming out to look at the weekly EUR/USD chart we can see that price fell slightly beyond the major 50% retracement level at 14.42 before retracing.